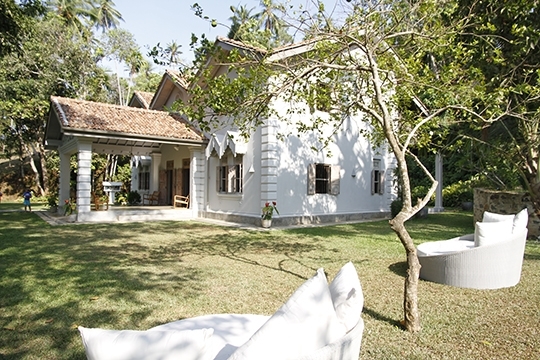 A chicly renovated historic manor house set in five acres of grounds a few minutes’ walk from Mirissa harbour (for seasonal whale- and dolphin-watching cruises) and a popular palm-fringed beach. Fully staffed, 4-bedroomed Siri Wedamadura has a fabulous swimming pool, alfresco living and dining areas and a well-equipped kitchen. 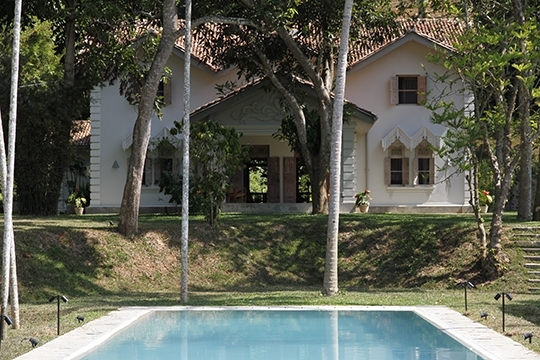 Beautiful conversions of historic manor houses are a highlight of Sri Lanka’s villa scene, and this house is no exception. 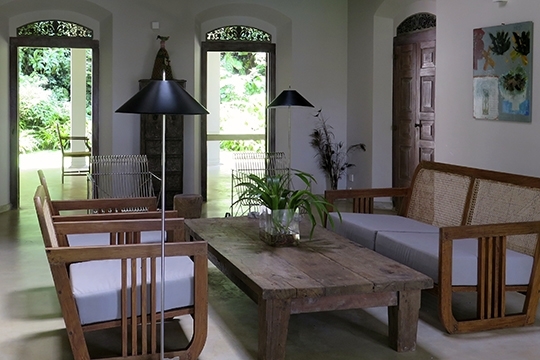 Dating back to the mid-nineteenth century, Siri Wedamadura is a sensitively restored house that’s been stylishly renovated for the modern age. 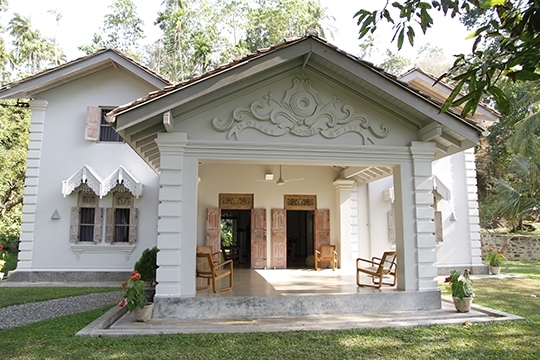 From the outside, this four-bedroom house regales its heyday; raised gingerbread fretwork porches framing the windows and doors are characteristic of houses of this period whilst the original shuttered doors and windows – above which stand similarly intricately carved ventilation panels – further evoke the era. The roof has been raised for enhanced airflow and to create a second floor. 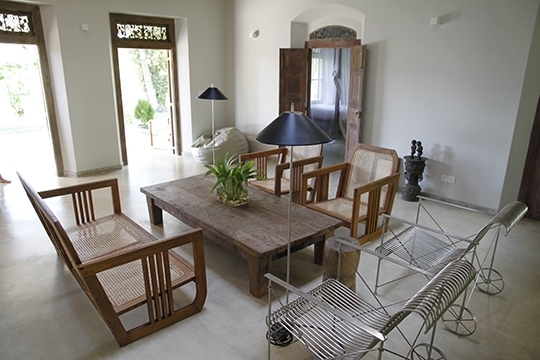 Step indoors and, although the essence of the house remains the same, the interiors are chic, stylish and contemporary. 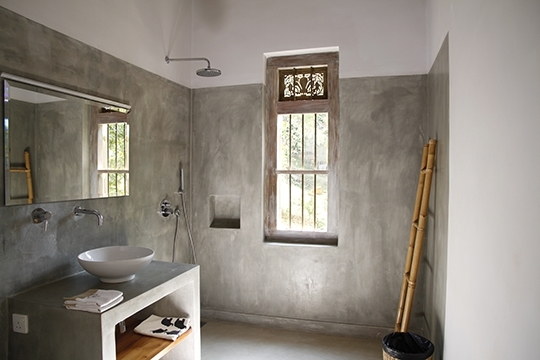 The light pastel colour scheme – pale olive, soft grey and limewashed timber – sets a soothing scene. 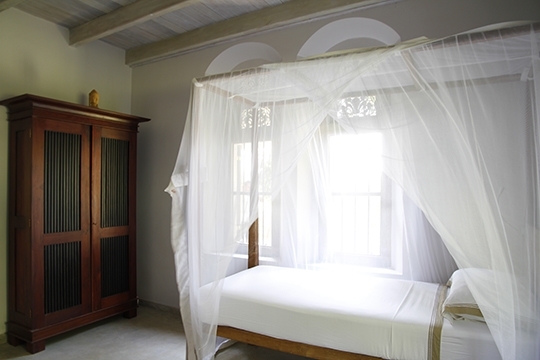 Each of the rooms is furnished minimally, which enhances the feeling of space, and the beds, chairs and tables mix authentic antiques with retro-esque reproductions. 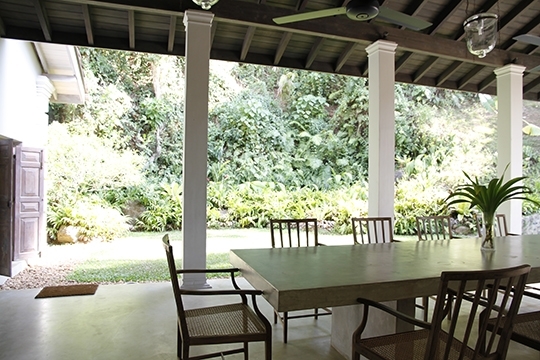 Living and dining areas flow onto pillared terraces open to the extensive five-acre tropical garden inhabited by peacocks and monkeys. It grows wilder as it rises to a peak behind the house with panoramas across Weligama Bay – worth the hike at sunset. Flanked by a terrace furnished with circular sun loungers is Siri Wedamadura’s beautiful pool, beckoning you to swim cooling lengths. 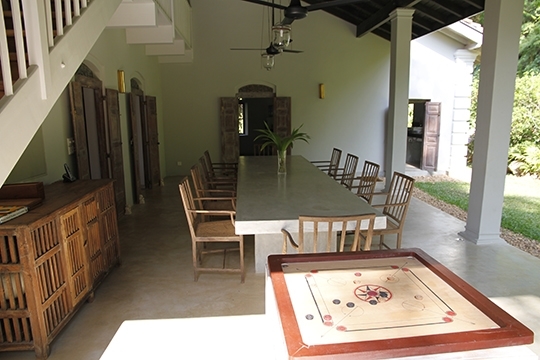 The house is a five-minute walk from Mirissa’s picturesque palm-fringed beach and even closer to the fishing harbour from which whale- and dolphin-watching cruises depart (between November to April). Among the house’s staff are a housekeeper and a cook, and there’s an off-site management team on call to assist you in booking local tours. An extensive suggestion menu of western and Sri Lankan dishes is available, with food and beverages charged to guests at cost price. 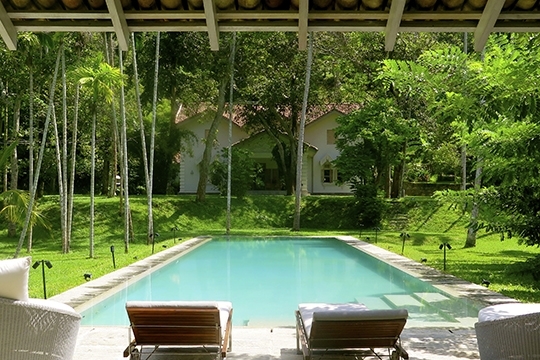 Siri Wedamadura’s great location, just a few minutes from Mirissa’s famed beach and scenic harbour, is a definite highlight. 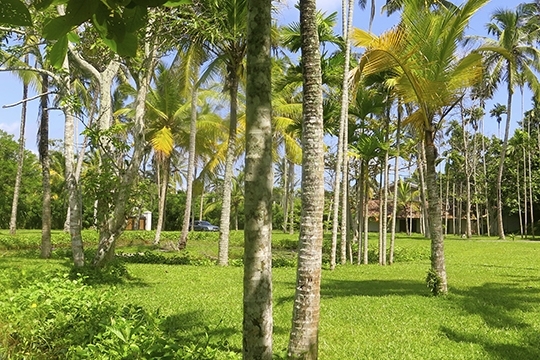 The lovely grounds are blessed with coffee plants, mango and cashew trees, and a summit with panoramic views of the ocean and neighbouring Weligama Bay. There is no air conditioning at the house and nor is there a TV. Expect some mosquitoes at dawn and dusk and, although we didn’t see any, the villa information book warned about the possibility of snakes (most are harmless) and other wildlife in the long grass or jungle areas, and suggested carrying a torch if wandering around outside at night. 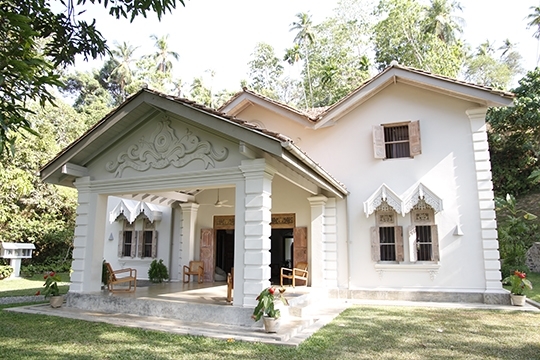 Siri Wedamadura is located in the heart of Mirissa, a two-minute walk from the resort town’s photogenic harbour (from which whale- and dolphin-watching trips depart in season) and a five-minute stroll from the beach. 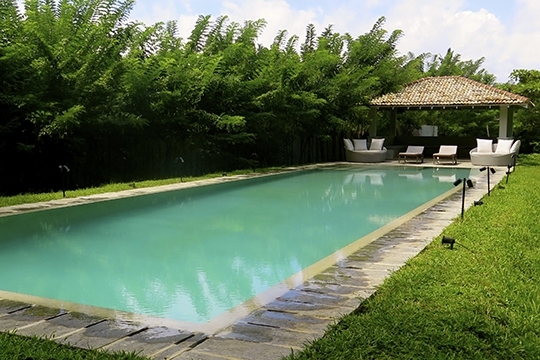 The house is set amidst five acres of grounds that stretch up a hillside behind the house; from the summit there are superb views of the ocean and coastline towards the neighbouring bay of Weligama. Mirissa’s palm-fringed sands are idyllic, although swimming is safer at the eastern end of the beach where it’s also possible to snorkel. Body boarding is popular in Mirissa whilst nearby Weligama is one of the best places to learn to surf. The picture-postcard beach of Mirissa is framed by overhanging palms that scatter their fringed shadows on the soft ocean-washed sand. This is a haven for sun seekers looking for a beautiful tropical beach with an easygoing ambiance. To the west of the bay is a rocky headland that separates the beach from the harbour whilst to the east is an rocky islet around which you can snorkel and swim. Mirissa’s waves are popular with experienced surfers and body boarders, and the bay is dotted with an increasing number of restaurants and bars. From Mirissa Harbour boats head out on whale and dolphin watching voyages (November to April), deep sea fishing and sailing whilst inland is a picturesque scene of paddy fields, coconut palms, pretty villages and cinnamon plantations. Just five kilometres west of Mirissa is the wide bay of Weligama – a popular beginners surfing beach, with plenty of tuition and board hire available – and the southern metropolis of Matara with its two Dutch-era forts. Both Weligama and Matara are equipped with banks, ATMs, pharmacies and supermarkets. The ground floor of the house follows its original nineteenth century footprint, although terraces have been added and the roof raised. There are four bedrooms, all with ensuite bathrooms; two on the ground floor that radiate out from a central living room, and two on the first floor. The interiors of the house are chic yet minimal. 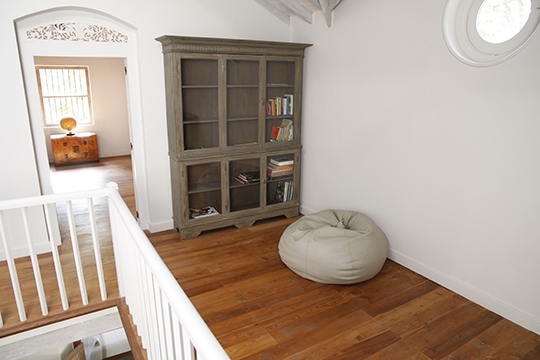 Smooth polished cement floors are a feature of the ground floor whilst upstairs your feet tread wooden floorboards. Bedrooms and living areas are scattered with eye-catching pieces of artwork (some by Russian artists), metallic mirrors and artefacts from across the world, whilst the minimal wood furnishings – a mix of modern copies and authentic antiques – were sourced locally. 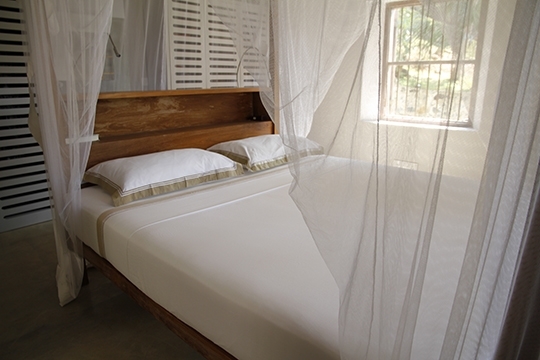 The house is broadly symmetrical and all of the bedrooms are an equitable size. 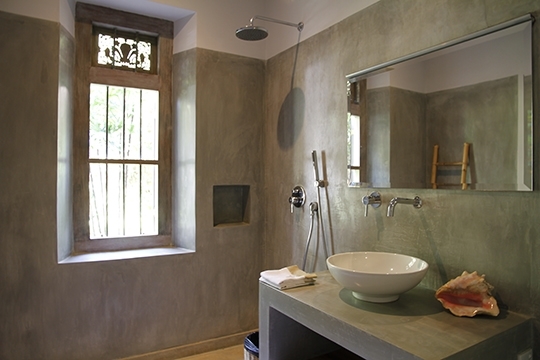 Cooled by ceiling fans, each has its own bathroom with shower, wardrobes or dressing areas and views of the garden. 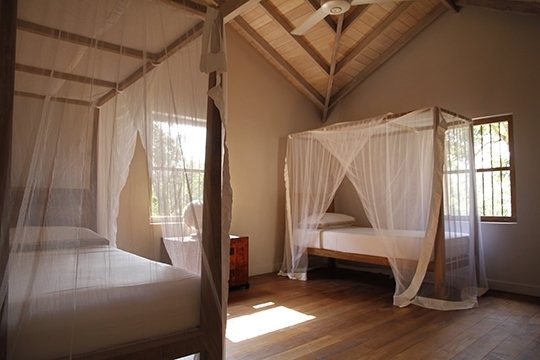 Of the four bedrooms, only the ground-floor master bedroom has a king-size bed, the remainder are twins, equipped with two single four-poster beds apiece. 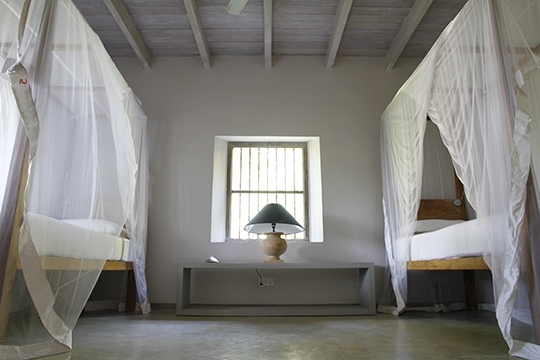 Each bed is dressed with soft mosquito netting and flanked by atmospheric table lamps. 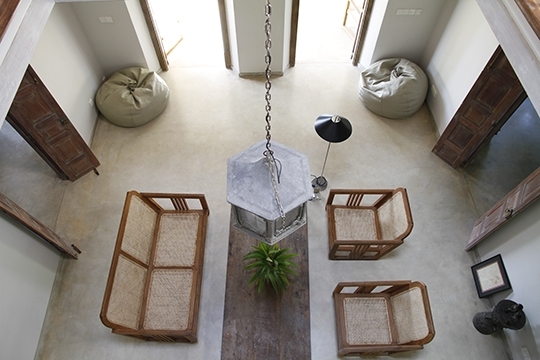 Both floors of the house offer living areas. 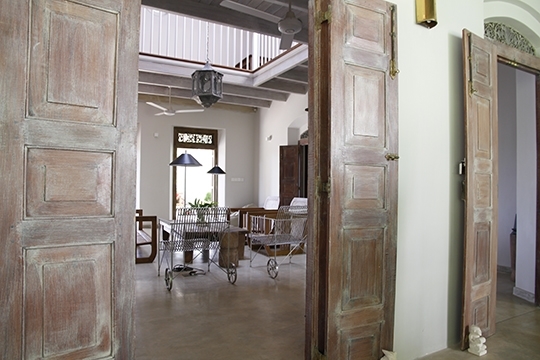 On the ground floor is a sitting room with double-height ceiling, furnished with mod-colonial style chairs and floor lamps. 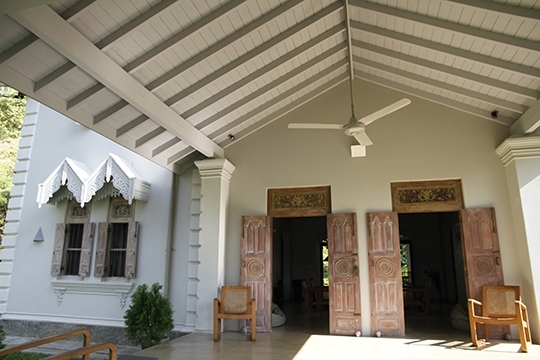 To the rear of the house is a big pillared, open-sided terrace, cooled by multiple ceiling fans and furnished with a cement dining table for ten. To one side, a door leads into a well-equipped kitchen featuring a wall of built-in cement shelving, a dishwasher, an oven and a big fridge. 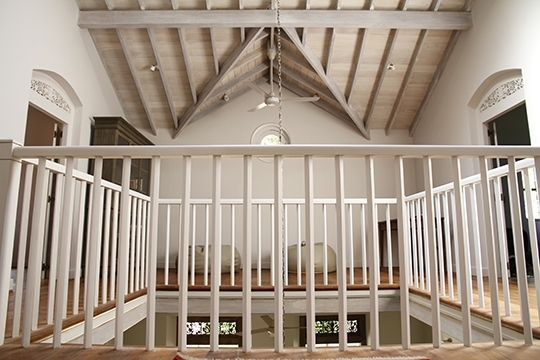 A timber staircase leads up from the dining area to the first floor where a mezzanine landing furnished with a writing desk and a book-filled cupboard looks down into the living room below. 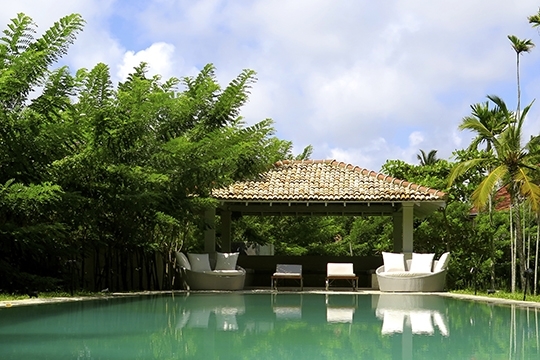 A small pavilion at the far end of the swimming pool is equipped for more relaxed lounging. (November - April) Cruise along this unspoilt stretch of Mirissa and / or Weligama coastline stopping off in places for snorkelling, swimming, picnics and sightseeing. Minimum hire time is 2 hours. Weligama Bay Cruises use traditional Maldivian sailing dhonis. (November – April) The continental shelf drops off lies less than 8 miles off the coast of Mirissa, and here big game fish can be found. The 54ft converted Indonesian fishing trawler used for fishing trips is equipped with modern satellite navigation, fish finding equipment, rods and a toilet. This gorgeous curve of sand shaded by hundreds of leaning palms is one of the south coast’s most picturesque and unspoilt stretches of sand. It is also peaceful and not overly developed. Rustic restaurants scatter the beach here and there are places to rent surf equipment. The sea is rough to the west of the bay, but to the east (near Pigeon Island) the sea is calmer and snorkelling is possible. Mirissa’s plushest dining venue is not the most imaginative in terms of cuisine – they tend to have lots of uninspiring buffets - but has a lovely location right beside the beach. Try to order a la carte, if you can. Head up the Polwatta Ganga river famed for its wildlife and unspoilt mangrove swamps. Look out for sea eagles, leaf monkeys, monitor lizards and crocodiles. Dawn and dusk are the best times to go. (November – April) Mirissa Water Sports hire out sea kayaks so you can explore the coastline at your own pace. (November – April) Head out either at 7am or 2pm for approximately four hours in search of whales; operating between November and April, you can see blue whales, sperm whales and lots of spinner dolphins. 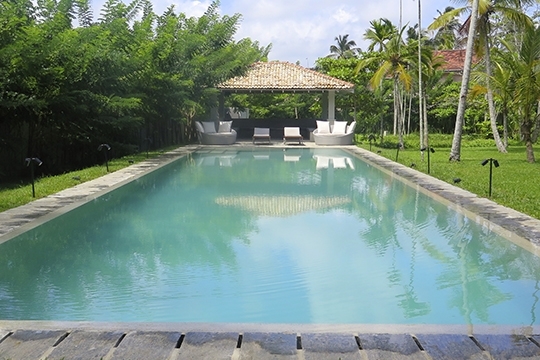 4 bedroom villa located in Mirissa, South Coast. Ideal for Beach in ten, Bring the relatives, Kid friendly, Fair share for groups, The great outdoors, Sensible for seniors, Room with a view, Walk into town.